UPDATE (May 6, 2012): On April 18, 2012, I filed a lawsuit against 9 named individuals. "Unbelievable," "incredible," "crazy" are frequent responses to the story of how Mark Lyttle, born in North Carolina, was illegally ordered deported to Mexico on December 9, 2008 with the imprimatur of William Cassidy, a former ICE attorney who presides as an immigration judge over hearings for people detained in southern Georgia. He is employed as an attorney by the Executive Office of Immigration Review (EOIR), an agency in the Department of Justice (DOJ). Similarly surreal, unreal, too real, calling to mind Alice as well as Kafka, were the events on Monday, April 19 at the Atlanta federal building on 180 Spring St. SW, where a phalanx of private security guards stormed the waiting room where I was writing notes on Mr. Cassidy's most recent bizarre behavior, discussed below. A private security guard told me I had to leave. I asked him why. Backed by others in his gang, he repeated his "order" and then he took out hand cuffs. Hayes shouted to additional guards in the lobby that he was acting at the behest of Mr. Cassidy: "Judge Cassidy wants her out of here! He wants her out of the building!" But Lauren Alder Reid, Legal Counsel for the EOIR's Office of Public Affairs explained to me that same day that as an employee of the DOJ, Mr. Cassidy has no legal authority over employees of the DHS. I guess a guy deporting a U.S. citizen without authority might not be so squeamish about ejecting a court observer from a federal building without authority. 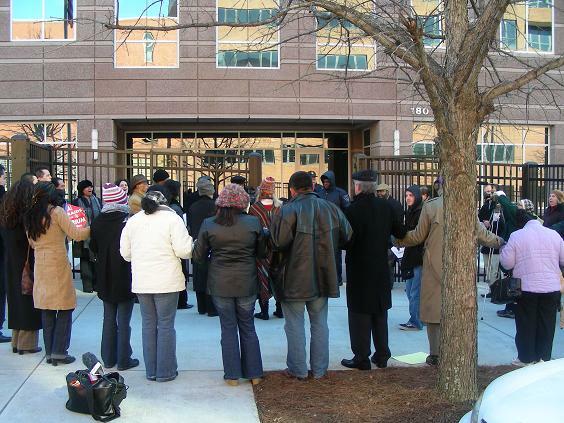 Atlanta Immigration Courts: "The Worst in the Country." Mr. Cassidy has a long record of poor judgment and unlawful actions reaching back to the 1990s. I have published some of this information; he knows I have more. In addition to deporting Mark, Mr. Cassidy has held at least one ex parte conversation with an ICE attorney in which he said he would rule against a respondent even though he thought this would be overturned, filed baseless retaliatory complaints against immigration attorneys, failed to record hearings properly, backdated a court record, accepted into evidence materials that have not been served on both parties, and unlawfully closed proceedings to Mark and me in October on the strength of a lie conveyed by the court administrator, Cynthia Long, who said she was acting on the instructions of "the ju" -- and then stopped, apparently attempting to keep this a secret. It was Mr. Cassidy's email to Jennifer Barnes in the EOIR's Office of General Counsel in late April, 2009, contemporaneous with Mr. Cassidy vacating his deportation order following Mark's return, that cemented my view of Mr. Cassidy as a classic bully, someone who kisses up to those who have power and influence, including certain Atlanta immigration attorneys, and kicks down those who do not--and I wrote as much in an affidavit that was copied to Mr. Cassidy in a case involving what I considered a frivolous, baseless, irrational misconduct complaint he filed and that the state bar to which it was referred closed without taking any action. 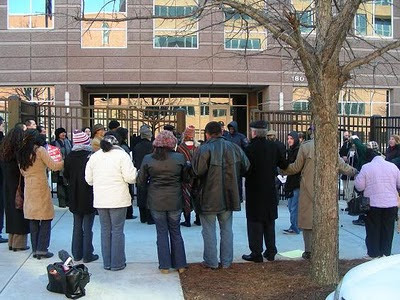 The EOIR, in addition to tolerating Mr. Cassidy's persisting in conduct violating federal regulations, the Immigration Practice Manual and the Immigration Judge Benchbook, also has failed to admonish the Atlanta EOIR for requiring the public to "check in" before attending court hearings, an unauthorized restriction on court access that my interviews with observers as well as my own experience demonstrates has been abused to close hearings that should be open to the public. EOIR Public Affairs Officer Susan Eastwood told me last October that it is not EOIR policy for visitors to "check in" before they may attend hearings. Moreover, the Atlanta EOIR court office appears to have committed document destruction, a violation of various policies not to mention the Freedom of Information Act. In order to document that Ms. Long and Mr. Cassidy were unlawfully closing his hearings I requested a copy of the docket the day I was turned away, by filing a FOIA request. Only one of the three cases appearing on Mr. Cassidy's 1 pm docket posted in the waiting area October 7, 2009 appeared on the docket printed on December 16, 2009. The cover letter, dated January 25, 2010 (far beyond the FOIA deadlines for a request submitted mid-October, another symptom of EOIR trying to cover up or delay exposure of misconduct) states: "Please be advised that the original Immigration Court calendar could not be located. However, the enclosed Immigration Court calendar was obtained from the Immigration Court database." When he is in court, Mr. Cassidy still fails to perform the duties of an immigration judge. He does not record significant portions of hearings, fails to note which portions are on and off the record, and does not summarize off-the-record exchanges when going back on the record--all required by the Immigration Judge Benchbook. He also fails to provide the name of the interpreter at the beginning of each proceeding. (The Immigration Judge Benchbook is online and is the EOIR's helpful response to critics who were pointing out the poor habits of some immigration judges. The fact that Mr. Cassidy and EOIR attorney and administrative judge Dan Pelletier (another former ICE trial attorney), also in Atlanta, fail to follow what is basically a script that any high school student could read suggests their disrespect for court rules and respondent rights are deeply ingrained; the EOIR clearly needs to do more than lead these horses to the water. Most of the morning was taken up with bond hearings, an occasion that allowed for interesting insights by the ICE trial attorney (located in Stewart) into Mr. Cassidy's approach to full hearings. He repeatedly told attorneys he would not negotiate bond because their motions did not include attachments with ten years of income tax returns and, absent these, Mr. Cassidy had a categorical policy of denying relief. Since the ICE attorney was so certain that Mr. Cassidy would deny relief without considering any other factors, the ICE attorney was opposing bond. The ICE attorney's rationale for denying bond violates a due process expectation that a bond hearing is different from merit hearings; if the trial attorney were in fact correct in surmising that Mr. Cassidy would never consider relief absent ten years of tax returns, this is a pretty grim summary of Mr. Cassidy's judicial temperment. But unless the ICE attorney expects respondents to know of Mr. Cassidy's strange proclivities on this point, legally available routes for relief should be sufficient to induce respondents to attend a future hearing and hence weigh on the side of granting bond. By second-guessing the respondents' mindset when faced with a judge who writes his decisions by-the-numbers and not individual circumstances--what if the tenth year were not filed because the respondent was suffering from an injury sustained after carrying NY fire fighters from the World Trade Center?--the ICE trial attorney forecloses the opportunity for such a respondent to appear in court (not by televideo) during the full hearing and present his case as a full human being, not a blurry monitor figure in orange uniform, or grey, if the monitor is not fully working. For the record, when he returned to the court room following one of these discussions Mr. Cassidy affirmed that the ICE attorney had accurately represented his rigid requirement for ten years of income tax returns. Other than to tell me that DOJ employees have no authority over DHS employees, EOIR's Ms. Reid, on behalf of Mr. Cassidy, provided no account for his rounding up his pals at Paragon. Mr. Cassidy also has not replied to previous telephone and email messages seeking comment on his deportation of Mark and the events in October. The immediate trigger for Mr. Cassidy's ordering private guards to have me removed appears to be an exchange we had shortly after 3 pm. I was the sole observer as he left the bench and, out of the camera's line of vision, walked toward me and asked me to leave. I asked him why. He said he had the authority to close hearings. I said that immigration hearings were generally open to the public subject to certain exceptions. I asked him if the respondent had requested a closed hearing. He said "No, the respondent is pro se," meaning without an attorney. Mr. Cassidy also said he could order me removed. I asked if he would give me a reason for why he was closing the hearing. He thought for a few seconds and then said, "No," and told me he was getting the regulation on closing hearings and that I should wait. I told him I was familiar with the regulation. He nonetheless left the court through the rear exit. Concerned about his implied threat earlier and also not interested in continuing this exchange I told the interpreter and administrator that I was going to the front office and that if the respondent happened to have understood what was happening and wanted me back, I would be there. The entire episode occurred in about 90 seconds. The reason I was concerned about the respondent is that Mr. Cassidy, according to Syracuse University TRAC analysis, has among the highest rates of denying asylum applications in the country. For 2004 through the end of 2008 he denied 88% of asylum applications, compared to 57 per cent nationwide; in 2008, the most recent year for data, the TRAC chart appears to indicate that he denied 100% of asylum applications. The regulation and rules allowing judges to close hearings to protect respondents in asylum applications are for the purpose of protecting people from retaliation by government agents from their home countries. Mr. Cassidy's high rate of denials suggests that in Mr. Cassidy's court, the respondents may have more to fear from him as an agent of the U.S. government than an undercover agent from Burma hiding behind court benches, for example. the public unless the respondent expressly requests that the hearing be closed. In cases involving these applications or claims, the Immigration Judge inquires whether the respondent requests such closure. At no point did Mr. Cassidy include either the ICE attorney or the respondent in this discussion. He certainly did not inquire whether the respondent requested a closed hearing. Ms. Crosby and I had a conversation about whether discretion in closing a hearing entailed legal reasons being provided contemporaneously. Since the DOJ has interpreted the regulation on public access to require a respondent's assent to closing an asylum hearing, it appears that Mr. Cassidy simply broke a rule. If he in fact were weighing other factors, then he needs to state these. The regulation does not authorize immigration judges evading all accountability, especially an EOIR attorney with the record of Mr. Cassidy. Today, the Executive Branch seeks to take this safeguard away from the public by placing its actions beyond public scrutiny. Against non-citizens, it seeks the power to secretly deport a class if it unilaterally calls them "special interest" cases. The Executive Branch seeks to uproot people's lives, outside the public eye, and behind a closed door. Democracies die behind closed doors. The First Amendment, through a free press, protects the people's right to know that their government acts fairly, lawfully, and accurately in deportation proceedings. When government begins closing doors, it selectively controls information rightfully belonging to the people. Selective information is misinformation. The Framers of the First Amendment "did not trust any government to separate the true from the false for us." Kleindienst v. Mandel, 408 U.S. 753, 773, 92 S.Ct. 2576, 33 L.Ed.2d 683 (1972) (quoting Thomas v. Collins 323 U.S. 516, 545, 65 S.Ct. 315, 89 L.Ed. 430 (Jackson, J., concurring)). They protected the people against secret government. On Tuesday afternoon I spoke with FPS Central District Commander Darren Summers. FPS is the DHS agency that contracts with the Paragon guards. After quizzing me on why I was "hanging out" at the immigration courts and asking who had "detailed" me to Atlanta for my research, Mr. Summers told me the guards had responded to an "order of a federal judge." Mr. Cassidy is not a federal judge but an administrative judge. I told Mr. Summers that Mr. Cassidy was employed by the DOJ and asked him how an employee of the DOJ could have authority over employees of the DHS. Mr. Summers, his voice dripping with condescension, said that I needed to do more research, as this would show me that "immigration courts are part of the Department of Homeland Security." This statement, so indecorous as to ignore the thin legal veil between EOIR and ICE, is also pretty awesome for illustrating the actual overlapping personnel and missions of the EOIR and ICE. (Three of the four EOIR attorneys in Atlanta are former ICE trial attorneys.) This blurring of legal authority between DOJ and DHS has consequences far more harmful than wrongfully removing a scholar/reporter from a building and committing battery. It pervades the atmosphere in which EOIR attorneys are rubber-stamping ICE attorneys' claims that are demonstrably lies and evidence of agent misconduct, including faked fingerprint reports, false assertions on ICE arrest reports, and illegally hiding exonerating evidence from respondents' and their attorneys. Most immigration judges, especially those who oversee hearings for non-detained populations, follow the rules and suffer the consequences of being overworked and underappreciated for their judicial temperment. Immigration judges with whom I've spoken mention only quantitative, not qualitative assessments, and believe that all EOIR HQ notices is their pace of hearings, and not the quality of their decisions. The fact that EOIR has continued to employ Mr. Cassidy, and colleagues who also show a long record of ignoring rules and regulations--more on others later!--seems to confirm this assessment. The actions initiated by Mr. Cassidy violated not only my civil rights, but are also a crime. Under Georgia law, misdemeanor simple battery is when an assailant "Makes intentional contact of an insulting or provoking nature with the person of another," which is a great definition of what happened. Mr. Cassidy appears to be running a criminal gang, one that is using force and threats of force to harm the public. I have asked FPS to retain a copy of the video and I have been in contact with the Atlanta police exploring the possibilities for filing charges. Correction 4/27/10: The original post said of Mark's comments to me on April 24, 2009, "Mark, who has never been in an immigration court before..." This was a mistake I just caught. It is corrected to read "had" since Mark has come with me to immigration court hearings in Stewart on a few occasions in 2010, long after the account he gave and I posted two days after he returned. You can read that here. People whose demons make life hard if not impossible to navigate not only suffer uniquely, but may pose special threats to those confined in their proximity, including ICE officers. In January and February New York residents and employees at the ICE lock-up on Varick Street in lower Manhattan were traumatized by this first-hand. According to Queens resident Chao Chen, private security guards and an ICE officer had first-hand knowledge that a man who was demonstrably violent was being held with the general population, but no one acted until after Mr. Chen was beaten, after which ICE tried to cover this up. Following several days of verbal threats and feints with a ball point pen that was taken away, at 2:30 a.m. on February 2, H.Y. waited in the dark on an empty bed, #155, on the far side from where he was supposed to be. A grievance written by the occupant of bed #156, B.D., states that he was disturbed by H.Y. 's menacing presence and asked him to return to his own side of the room. H.Y. told B.D. that "he wants to attack Mr. Chen Chao, who was sleeping at that time" in bed #158. H.Y. offered noodle soup to the occupant of bed #125 to "help him beat up Mr. Chen Chao, which he refused," B.D. wrote, "and told him to stop acting crazy." That night the occupants of B-1 were able to protect Mr. Chen from H.Y., who went back to his bed. But later that same day, after lunch, H.Y. lunged and stomped on the bed of the napping Mr. Chen. When he turned toward the noise, H.Y. began ferociously punching him in the left eye. Through a translator, a friend whom he had met at Varick Street, Mr. Chen described how others described the beating to him, "According to a witness, it seems like he had a rush of blood and just ran over and attacked." He began moving his fists up and down rapidly and said this went on for about ten seconds, "My eye was very swollen, like a panda." Mr. Chen said he and others at Varick were angry because everyone knew H.Y. had a mental problem: "Everybody was nervous because it was obvious he was dangerous and had a problem because he would walk on people's beds with his shoes." Even after the incident, Mr. Chen said that others conveyed that "Lt. Smith went to B-1 and told everybody that they did not have space to keep [H.Y.] in isolation and that it wasn't their problem." Shortly after that, H.Y. was gone. Chunyu Jean Wang, Mr. Chen's attorney, is upset, "He was sleeping and attacked by a mentally incapacitated person who should have been isolated. ICE is responsible for [Mr. Chen's] safety, but as a result of what they did there was bruising to his eye, which was blind for a few days." The events above were unfolding just before ICE relented to pressure from the ACLU and escorted me on a February 16 tour of the Varick facility, the very day ICE released Mr. Chen. Based on reports that ICE deportation officers at Varick were holding people without authority by not meeting with Varick inmates and thus not following up on new legal documents, I asked about specific incident of an individual who said his deportation officer had not seen him in three weeks. ICE New York Field Office Director Christopher Shanahan, who has an office in the same building as the ICE prisoners, denied this was possible, "We wouldn't want to put someone in a dorm and leave them there. That's not good for them or for us." And yet Mr. Chen was held months beyond when he should have been released and went for long stretches without seeing his deportation officer. Moreover, the tour guides' eagerness to emphasize the quality of their medical and psychological care seemed excessive and compensatory. Dr. Peter Dorazio told me that everyone had a psychiatric exam within 12 hours of being admitted, but didn't mention that he had recently read a report on Mr. Chen's attack and assailant indicating these tests were either inadequate or ignored. The week before another Varick inmate had told me a version of the story I later heard from Mr. Chen himself. When I called Mr. Shanahan after the tour to ask follow up questions I mentioned this attack. I had some of the facts wrong but the basic outline was correct. Instead of explaining the incident fully, Mr. Shanahan categorically denied that anything resembling what I had described had happened. I asked whether, if something like this had happened, he would have been informed or whether I should follow up with someone else . He said that had anything like this he certainly would have known about it, and discouraged me from making further inquiries. By the time Mr. Chen contacted me, the information was too late for inclusion in The Nation Comment I wrote about ICE's lawless refusal to regulate its detention operations. In a recent email responding to my questions, Mr. Shanahan did not confirm or deny that his initial is "S" or that he had been notified of these events. Again, the underlying problem is not Varick or even Mr. Shanahan but Secretary of Homeland Security Janet Napolitano's failure to obligate ICE detention operations to the rule of law, itself delusional reckless behavior threatening to different degrees the safety of the mentally ill, and everyone else in ICE detention operations -- those with shackles and keys alike. It is likely that Mr. Chen will be filing a lawsuit and that ICE will settle it for an undisclosed amount. This is not justice but stupidity, the biggest dunces being the U.S. public who are eager to toss billions of dollars to government and private security, militarized borders, and payments for kooky practices instead of reaping the benefits of free movement. ICE and before that the INS have been happy to use the taxpayer's checkbook to fund their thuggery. An experienced San Francisco Bay Area attorney pointed me to the numerous lawsuits in the 1980s against INS because of agent brutality, and mentioned one in particular, Willie Witt, Jr., was a special problem:"[INS] kept promoting him. It cost them hundreds of thousands of dollars in lawsuits. But they just kept paying out the lawsuits and promoting him." Despite repeated allegations of misconduct, the INS has investigated only one allegation of misconduct during a factory raid since 1982, said Steven A. Brick, an attorney for the plaintiffs. During that period, no INS agent was disciplined for violating the rights of the accused, he said. The sole investigation involved actions of one agent at Modern Mode Inc., a furniture factory in the Alameda County city of San Leandro. About 20 INS and Border Patrol agents arrived on the morning of July 20, 1983, and began questioning, then handcuffing workers. When Jose Mendes, plant superintendent and a legal U.S. resident from Portugal, demanded a copy of the warrant, an agent replied, "You don't have no rights to ask me what's going on," Mendes testified. INS agents told Mendes that he would be arrested unless he went away. Mendes' run-in might have ended with him walking away. But as he left, he told the judge, he cursed the agents. One agent then ordered another to "get him." Before Mendes could turn, Agent Willie Witt Jr. grabbed him around the neck, forced him to the ground, then threw him from a loading dock to the ground, about three feet below. Mendes began hyperventilating as he sat, handcuffed, in an INS van. When he asked agents to roll down the windows, one of them replied, "You should have thought about that before." Mendes was arrested on suspicion of assaulting a federal officer. Prosecutors declined to issue charges, but Mendes spent a night in San Francisco County Jail. Anthony Ratto, owner of Modern Mode, wrote to President Reagan about the incident. Describing himself as a "loyal Republican," he said: "Mr. President, something wrong occurred at my plant on July 20, and I believe the facts should be brought to light." As a result, the INS investigated--but not until more than a year later, according to documents released to the plaintiffs. An INS internal affairs investigator interviewed none of the witnesses and never contacted Mendes. Instead, the investigator relied on notes an FBI agent took in interviews with INS agents and Mendes, and on depositions of some of the workers. The INS found no evidence of wrongdoing when the investigation was concluded in September, 1984. INS Commissioner Alan C. Nelson wrote Witt that the charge was "unsubstantiated," and he "sincerely regretted any hardship or inconvenience you may have experienced." That's the last line in that article, but the story wasn't over for Mr. Witt. A 1999 article in the SF Chronicle, "When the Case Is About Lawyers," shows how Mr. Witt applied lessons learned from watching INS settlements and sued for race discrimination. Mr. Witt is African-American. Another INS agent in the office, who was white, also sued. Witt's case settled for $55,000 and his agreement to retire. A photograph taken last week shows that two and a half months later Mr. Chen's left eye remains somewhat dark and swollen in contrast with his right eye, and his vision is still blurred: "Its like a curtain that you open up, and there's another curtain," he explained. Mr. Chen's attorney, Ms. Wang, is outraged, not just because of the attack but because Mr. Chen never should have been in custody. He is among those for whom China will not issue travel documents. (The Supreme Court has prohibited ICE from keeping people locked up solely because of statelessness or because a country refuses to issue travel documents to one of its citizens, but ICE routinely ignores this.) "Because ICE held him past a reasonable time, past the time legally allotted," she said, "they gave a mentally incapacitated person an opportunity to attack him."